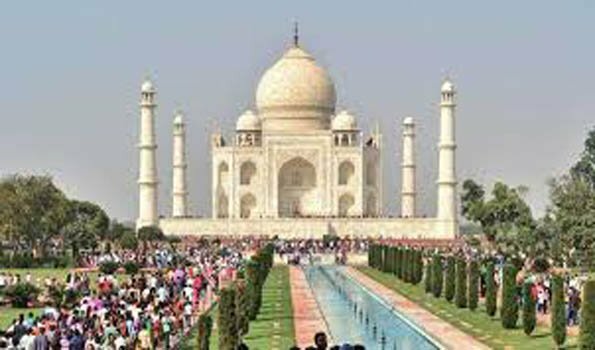 Agra: Tourists visiting Taj Mahal from Monday will have to pay additional Rs 200 to enter the main Mausoleum, which houses replicas of Mughal emperor Shah Jahan and his wife Mumtaz Mahal's graves. On August last, the entry charge for domestic tourists was increased from Rs 40 to Rs 50.The move will hit domestic tourists the hardest, increasing their overall ticket price by five times (Rs 250), if they wish to see the grave replicas. Mr Vasant Kumar Swarnkar, Superintending Archaeologist, Agra circle, Archaeological Survey of India (ASI) said here on Monday that the new rate of entry fee has been enforced.The new ticketing system will help reduce the footfall on the main structure and will control the crowd. Now the visitors who buy the Rs. 50 ticket would not be allowed to enter the main mausoleum, but would be able to move around the Taj and see the rear side, the Yamuna river front at the back. The Taj Mahal is considered one of the finest specimen of the Mughal architecture and in 1983, it became a UNESCO World Heritage Site and was cited as "the jewel of Muslim art in India and one of the universally admired masterpieces of the world's heritage." Any tourist, Indian or foreigner, will be required to pay Rs 200 extra if they intend to go inside the main mausoleum to view the graves of the Mughal emperor and his wife," Mr Swarnkar said. The original graves of Shah Jahan and Mumtaz Mahal are located in the basement of the main mausoleum.However, these are inaccessible to visitors throughout the year, barring the three days of Shah Jahan's 'Urs' when the way to the basement is unlocked for devotees to pay obeisance to the Mughal emperor.